A conflict of interest can devastate your board of directors and your entire organization. Unfortunately, I witnessed one of these conflicts of interest during my consulting career. I’ll spare you most of the details, but the association decided to create a new member benefit and contracted with a board member to create the new program. The director did not resign from the board after being granted the contract, which was also awarded without soliciting any competing bids. A few of this director’s colleagues felt (justifiably) uncomfortable with the process, and word of the arrangement leaked to members. Several board members resigned, and I ended my consulting relationship. This incident was a textbook example of a conflict of interest. The board chair didn’t even ask the director being awarded the contract to recuse herself during the vote. Trust me: You don’t want to find your organization or your board of directors in a similar situation. It was an awful experience for everyone involved. 1. Conduct a board orientation. Many organizations fail to conduct a board orientation. As soon as a new director joins your board, schedule a meeting to review policies, procedures, board strategy, and the status of current initiatives or projects. As a part of the orientation, make sure you review what is expected of directors, including ethical guidelines and the organization’s policy on conflicts of interest. Make sure every director reviews and signs an acknowledgement that they’ve received your conflict of interest policy. And, be sure to maintain those records. 2. If it could be misunderstood by the public or your stakeholders, don’t do it. A potential conflict of interest isn’t always black-and-white. The reality is that small organizations often depend on their board of directors to fulfill some operational roles and leverage personal and/or professional relationships for the organization’s benefit. There are times when whether something is a potential conflict of interest can be a gray area. One way to evaluate those situations is to consider how the public or your stakeholders would interpret the scenario. If a director is in any way using his or her position on your board to personally enrich themselves, even indirectly, there is a good chance your stakeholders would think the worst—even if the organization and the director have the best intentions. …then the director should resign from the board. Prior to resignation, the director should recuse himself or herself from all discussion and voting on the potential business relationship. When it comes to potential conflicts of interest, your board of directors should always err on the side of extreme caution. A board of directors is intended to be a steward of the organization’s resources. Breaking the trust inherent in a stewardship role can do permanent damage to the organization’s brand and reputation in the community. Fortunately, BoardPaq, the board portal of choice for trade associations, nonprofits, cooperatives, school districts, community banks, credit unions, and other cost-conscious organizations has tools to help keep your board of directors from creating a conflict of interest. • The ability to create and update custom forms, including a conflict of interest form. • An accurate record of all minutes and agendas that refer to a topic that could potentially be perceived as a conflict of interest. • A record of all electronic discussions that occur within BoardPaq and address potential conflicts of interest. • A robust set of tools that creates a board conducting business with a maximum amount of transparency. For most small board-led organizations, the potential for conflicts of interest is almost inevitable. That’s what happens when you have a small group of people who are committed to a cause and willing to leverage their own resources (including time, talent, money, and their personal and professional network) in service of the organization’s mission. The potential for a conflict of interest doesn’t mean an organization or an individual director is inherently unethical. How you handle the potential conflict is what really matters. 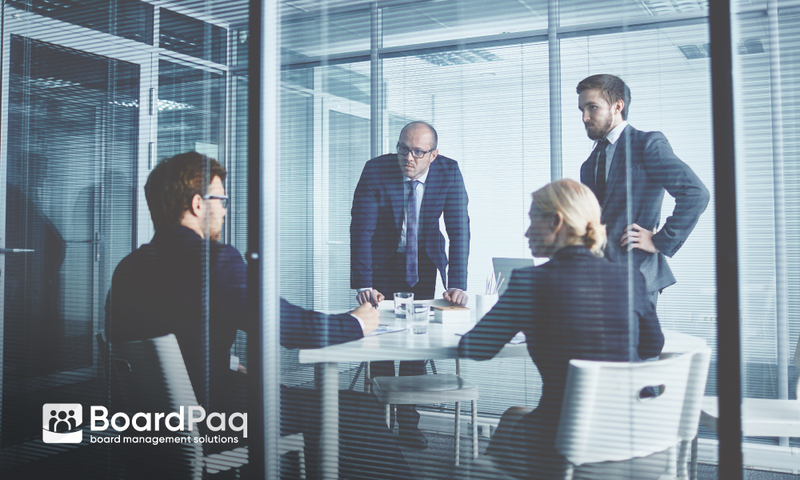 And with BoardPaq, you’ll be better positioned to prevent any potential conflict of interest from negatively impacting your organization and your board of directors.